After a long hiatus of anything resembling Winter, here in Michigan we have been back in the deep freeze the last few days with a blanket of snow finally covering up all those leaves we never raked last Fall (and that until Saturday seemed to stare accusingly at me!). So maybe it is a good time to think about all things tropical and colorful for a few moments even as doing so will give us a chance once more to praise God for his creation splendors. Thanks to my wife, we support the Cornell Ornithology Lab and so receive their quarterly magazine about birds. The other day my wife was reading to me a few paragraphs in an article about the Bowerbird. This bird, which lives in Australia and New Guinea, is one of nature’s most wonderful artists. The male bird in particular labors long and hard to decorate his nest in an attempt to capture the attention of female birds. These birds literally try to capitalize on bright shiny objects that they find along the way in their travels. Many such birds seem to like the color blue in particular. But they decorate with almost anything: fruits, nuts, bottle caps, pieces of broken glass, buttons, pieces of colorful fabric. Starting some months back I have been writing up the weekly sermon starter articles for my Center for Excellence in Preaching website based on the Lectionary weekly Psalm selection. One thing you notice right away as you peruse the Psalms is how often they call on us to praise God for his majesty, creativity, and beauty as displayed in the physical world, in the Creation. (This coming Sunday’s selection of Psalm 19 is one particularly good example.) Too often, though, we don’t take the chance to do so. We are too busy looking at our screens, taking selfies, or being otherwise distracted by anything other than the beauties and wonders that God has surrounded us with. 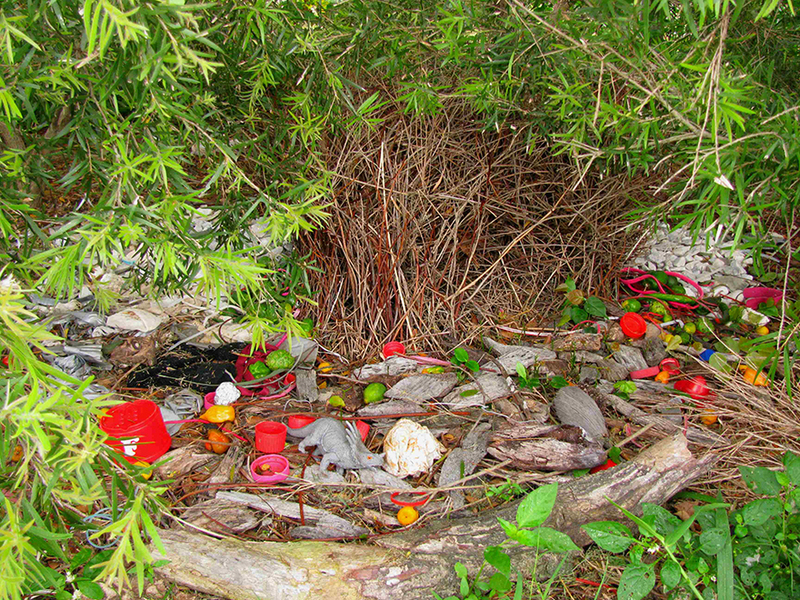 So on what is in many places a cold, wintry January day, I invite you to enjoy the Bowerbird: their crazy pretty nests, their amazing plumage, their stunning courtship ritual. Enjoy all that but then make the connection the Psalms foist upon us: praise God from whom all such creation blessings flow. Wonderful, Scott. One of the greatest gifts that my dad gave to me was to urge my siblings and I to be observant – to look around and marvel, to ask why, to appreciate simple things, to make note of complex and beautiful things – and to praise God for everything. Creation is indeed full of never-ending wonders. Outdoorspeople, whether they be hikers, birders, hunters, trappers, fishermen, or whatever other similar category, have a distinct advantage in that they are already placing themselves outside often, and the thrust of their activity calls for them to slow down and observe.